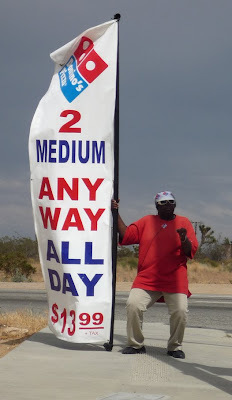 All the chain pizza joints "in town" (that's Yucca Valley) hire these poor young kids to stand outside in the blazing, emission-filled heat with big signs pointing you to their establishments. Usually you see some miserable looking high school boy just standing there behind the sign, but occasionally he's replaced by a more enthusiastic, older, heavier guy, sweating in the heat, and stabbing his arrow-shaped sign in the direction in which you're supposed to turn off the highway. Today I had the joy of spotting this sign-holder get down, dancing like there's no tomorrow. After I snapped this shot we waved at each other and I drove away.